When people ask me my favorite comic of all time, I don't even have to think about it: The Brave and the Bold (1955), which should come as no surprise to those who have followed this blog since the beginning. It checked all the boxes for me - it prominently featured my favorite artist Jim Aparo and my favorite DC hero, Batman. Also it was a team-up title which I of course went nuts for. Before that, it was the try-out comic for many great concepts - The Suicide Squad, Teen Titans and Justice League of America among them. Finally, it presented the return of many a Golden Age hero for new life in the Silver Age like Hawkman, Hourman, Wildcat, Doctor Fate, Green Lantern and the two above. What a series! I understand that excitement. I enjoyed Brave and Bold as well. But Marvel Two-in-One and Marvel Team-Up were my favorites. I really loved their covers too. Those were Top Three favorites, too. Back when comics were "STILL only $0.20!" 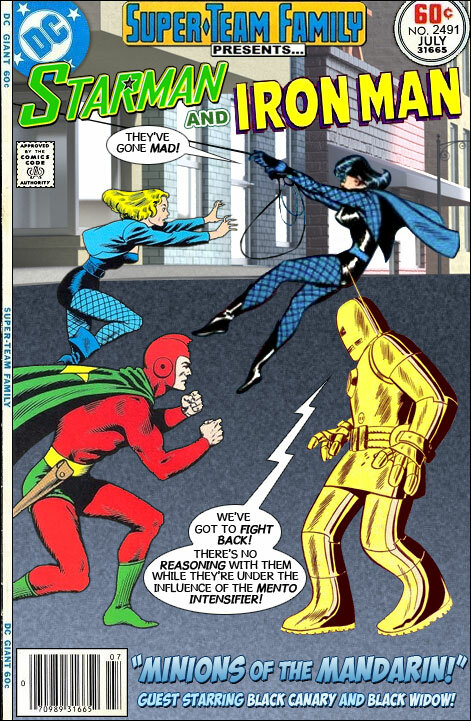 Coincidence strikes: I re-read that Starman/Black Canary/Wildcat revival story (reprinted in a one-off 'JSA 80-page Giant') just a couple of evenings ago. Back in the early Iron Man issues of Tales of Suspense, they used poses similar to this more than once on the cover. I wonder if Dinah and Natasha (and Zatanna too?) buy their fishnet stockings from the same retailer. Aside from The Legion of Super-Heroes, my favorites were the Big Two's team-up books: The Brave and the Bold, DC Comics Presents, Marvel Two-In-One and Marvel Team-Up. And yes - Jim Aparo was the big draw of that particular book. Listen to the Mandarin Reign. I'm a Punny Guy, I might be among the Punniest you'll ever interact with. As a kid I read Brave and the Bold and realized that that series was not in the same world as rest of DC Universe but loved it. @Glenn: I know what you mean. The earliest issues I ever read of B&B, in the early-to-mid-Seventies, had Batman doing uncharacteristic things. Like flying commercial down to South America, with Richard Dragon, in full costume...in broad daylight! Of course, I now realize that was the remaining influence of the BATMAN '66 series. But, at the time, I thought to myself: "Whoa! Why aren't they using the two-seat Batplane by night?!" The Thing and Starman in: "Skirmish on Skrullos!"